There is a disturbing trend that appears to have developed since the 2008 depression and the real estate crash. many people are living a nomadic semi retired lifestyle. Many people lost their homes due to foreclosure, loss of jobs and also loss of savings. The value of homes plummeted and many found that their home was less than what they originally paid and less than their mortgage. Many chose to walk away. At the same time, the stock market fell over 50%. If you sold your investments you locked in your losses and never recovered. with so many companies going bankrupt and cutting back, many lost their jobs. Whats left for these people. They rent homes, they have low paying jobs and some live in RV’s and follow the temporary job route. These seniors do not have sufficient savings to retire. 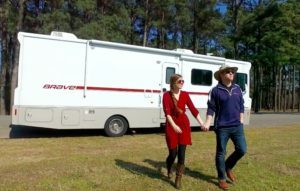 They buy older RV’s and live in trailer parks or other temporary locations around the country. They need to work and will go wherever they need to go to find temporary work. Of course they would like something more permanent, but these kinds of jobs are long gone. They work at seasonal jobs for companies like Walmart and Amazon, or worse in the fields planting and picking crops. Hard work and they walk many miles every day. These folks are trying to survive and live as nomads traveling around the country, many living on less than $1000 a month. They lost their 401k investments in the market, they do not have a pension and they are too young in many cases to collect state and federal handouts. They need to work and survive on little money where ever they can. This is a rough life for seniors Living a Nomadic Semi Retired Lifestyle or really anyone at any age trying to get by with this lifestyle. For more lifestyle related posts, click here. This entry was posted in Senior Life Style and tagged Lifestyle Decisions on 2018/01/21 by ernie.